The Yamas & Niyamas, yoga's ten ethical guidelines, are foundational to living skillfully. These guidelines free you to take ownership of your life and direct it towards the fulfillment you seek. The Yamas & Niyamas, yoga's ten ethical guidelines, are foundational to living skillfully. Click here to buy directly from Amazon.com. The Yamas & Niyamas is also available digitally on Kindle and Nook, and in other electronic formats via www.ebooks.com. This book is softcover, 192 pages and retails for $12.95. The Yamas and Niyamas are foundational to all yogic thought. Yoga is a sophisticated system that extends far beyond doing yoga postures; it is literally a way of living. Yoga is designed to bring you more and more awareness of not only your body but also your thoughts. The teachings are a practical, step-by-step methodology that bring understanding to your experiences, while at the same time pointing the way to the next experience. They are like a detailed map, telling you where you are and how to look for the next landmark. They facilitate taking ownership of your life and directing it towards the fulfillment that you seek. The Yamas and Niyamas may be thought of as guidelines, tenets, ethical disciplines, precepts, or restraints and observances. The author, Deborah Adele, says, "I often think of them as jewels, because they are the rare gems of wisdom that give direction to a well-lived and joyful life." In Yogic philosophy, these jewels sit as the first two limbs of the 8-fold path. The first guidelines are referred to as the Yamas, a Sanskrit word which translates literally into the word "restraints" and includes nonviolence, truthfulness, non-stealing, non-excess, and non-possessiveness. The second five guidelines are referred to as the Niyamas, or "observances," and include purity, contentment, self-discipline, self-study, and surrender. Many guides to ethical conduct may leave us feeling overwhelmed with concepts, or boxed in by rule sets. But Yoga's guidelines do not limit us from living life. Rather, they begin to open life up to us more and more fully, and they flow easily into one another in ways that are practical and easy to grasp. 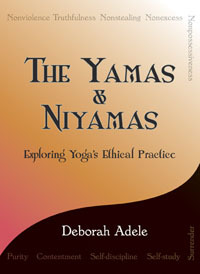 In this book, The Yamas & Niyamas: Exploring Yoga's Ethical Practice, by Deborah Adele, ERYT-500, each Yama and Niyama has been given its own chapter in which the philosophy of the guideline is woven with practical examples and stories. At the end of the chapter a list of questions is provided for group or self study. Perfect for teachers to use as a framework for an extended study / in-depth class. Also great for book clubs, AA recovery groups, or anyone looking to live a more skillful life. If you are interested in inviting Deborah Adele to lecture or teach at your studio, store, or event, please contact her directly at Deborah (at) DeborahAdele (dot) com or visit her website www.DeborahAdele.com for more information. This book is available for foreign rights. Email us at contactus@onwordboundbooks.com for more information. To download the Free Facilitator's Guide (PDF 221K) click here. See a PDF of the Table of Contents. See a PDF of the Preface and Introduction. Watch Deborah's video workshop on Yoga International. Quantity rates available for stores, studios, teaching centers and other groups. See our ordering page for details. "Beyond moral precepts, the Yamas and Niyamas are guidelines for living a healthy life. With the voice of a storyteller, Deborah Adele brings this ancient wisdom to light with modern tales common to us all. This is the behavior we need for a sustainable world." "Deborah's book, The Yamas & Niyamas: Exploring Yoga's Ethical Practice, really brings these jewels to the light and to the world. As a yoga teacher I have been looking for something for my students that can lead them to join me in a life long love affair with the Yamas and Niyamas - and this is it!" "Deborah Adele has written a jewel of a book. In this volume, we find not only the practical insights of classical yoga, but simultaneously the deep wisdom, subtlety, and joyfulness that these practices produce. The Yamas & Niyamas: Exploring Yoga's Ethical Practice is a must read for anyone interested in spiritual wisdom." "After reading The Yamas & Niyamas: Exploring Yoga's Ethical Practice, I wanted to return all my other books to the shelf and just practice these teachings. The insights that Deborah Adele draws from yoga's ethical guidelines have helped me to better understand my Christian faith. I am buying a copy of this book for each and every member of my prayer groups." "The Yamas & Niyamas is a great book-one that I've been looking for, for a long time. Deborah's style is fresh and truthful, her writing inviting and inspiring, and her suggestions for integrating the concepts into life - downright simple. You'll learn a lot from this book and along the way you'll have fun exploring yourself." "Compassionate, lively, and wise, The Yamas & Niyamas provides a portal into a recognition beyond tradition; a living way to relate from our highest vibratory level into our present world, regardless of cultural or religious background. Like the Tao expresses itself as yin and yang, these restraints and observances are presented as the swinging doors into the unconditional, liberating us from the bonds of our day to day stressors and uniting us with the One truth for which we all hunger. It fed me." ~ Randine Lewis, MSOM, L.Ac., Ph.D., Founder of The Fertile Soul: www.thefertilesoul.com, Author of The Infertility Cure and The Way of The Fertile Soul.